Polls showed France’s presidential election campaign tightening further yesterday (12 April) as financial markets fretted about the rising popularity of a far-left candidate who wants to put France’s European Union membership to a vote. Investors have long been anxious about election frontrunner Marine Le Pen, leader of the far-right National Front, who has promised a referendum on whether to quit the EU and ditch the euro. She has been joined on the list of investors’ concerns by far-left veteran Jean-Luc Mélenchon, who has surged in the polls after strong performances in two candidates’ debates. The Communist-backed Mélenchon also wants a referendum on EU membership after an attempt to renegotiate the EU treaties. 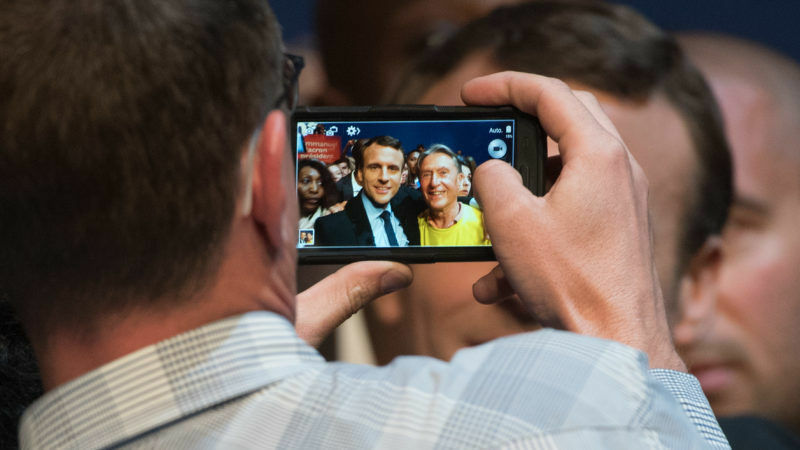 The latest Ifop-Fiducial poll on Wednesday showed Le Pen winning 23.5% in the 23 April first round, one point ahead of centrist Emmanuel Macron. Both Le Pen and Macron’s support dipped by half a point from Tuesday (11 April) while conservative François Fillon was stable at 19% and Mélenchon unchanged at 18.5%. The top two candidates go through to a run-off on 7 May, where polls say Macron would easily beat Le Pen. Traders cited the French election, as well as US relations with Syria and North Korea, as reasons why investors switched to safe assets, such as gold or US Treasuries, on Wednesday. “Risk sentiment is not strong at the moment because of tensions in North Korea and also risk of a … rising Mélenchon,” said Nomura currency strategist Yujiro Goto in London. Concern about a Le Pen victory, which would put further pressure on the EU after Britain’s decision to leave the bloc, led to an unusual foray into French politics by Germany, France’s traditional partner at the heart of the EU. “We need a pro-European France,” German Finance Minister Wolfgang Schäuble said in Berlin. “I hope Le Pen does not become French president,” he added. Outgoing Socialist President François Hollande is also concerned about Mélenchon’s rising popularity, according to Le Monde newspaper, and this has fed speculation he could endorse Macron as the best hope to win rather than official Socialist candidate Benoît Hamon, who is doing poorly in the polls. In an interview with Le Point published on Wednesday, Hollande kept silent about his choice, saying he would endorse a candidate before the second round of the election. 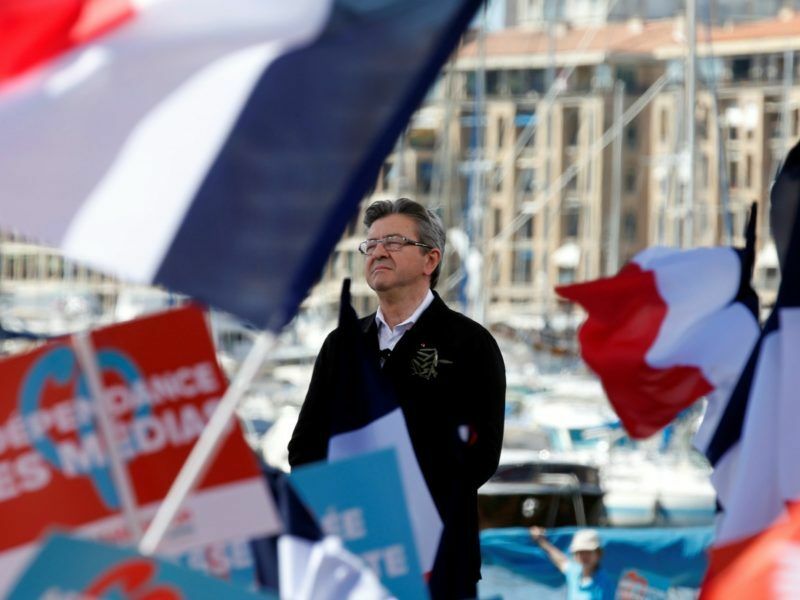 But he spoke highly of the decision by Macron, a former economy minister in his government, to launch a new party, saying “I think politics needs renewal” and he spoke out against demagoguery. “There is a danger in simplifications and falsifications which make people look at the … speaker rather than the content of what he is saying,” he said. Hollande, an unpopular president who did not seek a second term, said ruling parties should not hold primary elections in future, because it was impossible to be president and candidate at the same time. The conservative Le Figaro newspaper called Mélenchon “the French Chavez”, alleging in a front-page story that his plans were inspired by the late Venezuelan leader Hugo Chavez. Mélenchon mocked his new notoriety in a blog on his website. “They announce that my winning the election would bring nuclear winter, a plague of frogs, Red Army tanks and the landing of the Venezuelans,” he said. If Hamon accepts he cannot win and stands down in favour of Mélenchon then a runoff between Le Pen and Mélenchon could be the most likely result. I suspect Hamon’s phone is busy, both with Mélenchon supporters and those wishing to avoid a runoff between two economic lunatics who are also anti EU.